Very good experience except for not getting a much needed wake up call. Set phone for wake up call also and would have missed plane if we had relied on a wake up call from the front desk. This is the 2nd time in two months this has happened. Did not get wake up call. Very disappointed in that. Friendly and comfortable. Hotel store open until 10 pm and early use of the exercise room, coffee in the morning, and shuttle schedule to return to the airport was convenient and pleasurable. On arrival at night, the shuttle took 40 minutes to arrive. Quiet and comfortable, exercise room available. Waited too long for the shuttle bus at the airport on arrival. 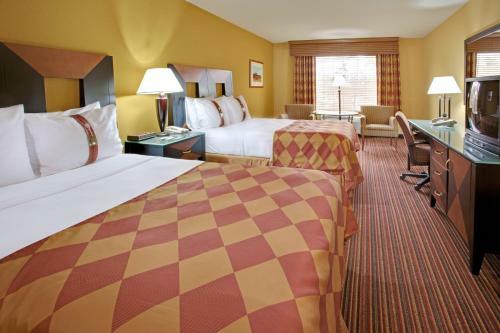 Conveniently located within minutes of the George Bush Intercontinental Airport and near companies like ExxonMobil, Chrysler and Halliburton, this Holiday Inn provides the accommodations you'll need to get your trip off on the right foot. Good Eats Grill, the on-site restaurant, has an inviting atmosphere and delicious food. Spacious rooms pamper your senses with comfortable mattresses, and basic amenities like coffee makers, hair dryers and ironing boards. An on-site exercise room with an outdoor pool and outdoor wading pool for children help you stretch your muscles before relaxing in your room at the end of a long day. Free parking for registered guests and room service until 11:00 p.m. make your stay easy and convenient, while free meals for kids add extra perks for parents. The majority of guest rooms at this hotel are non-smoking, but with suites, pet lodging and accessibility options, they meet the needs of most guests. Basic rooms come with coffee maker, hair dryer, iron and ironing board, and a work area with data ports and two dual-line phones with speaker phone capability. Upgrades include sofa-beds, sitting areas and more. Take the complimentary airport shuttle to the hotel where you can freshen up in your spacious bathroom or head right to the on-site restaurant, exercise room or outdoor pool. 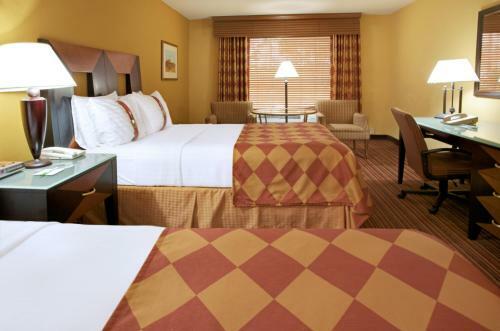 Once back in your room, order room service, watch some premium cable television or order up a movie on PayPerView®. Check your voice mail messages, log onto the internet using analog, high-speed or wireless high-speed internet or stop by the business center to get some work done. Copy papers, e-mail, surf the internet on the hotel provided computer, print or send and receive faxes from anywhere in the world. You can even take advantage of secretarial services provided by the hotel. While this hotel had fairly mixed reviews, none of them were terrible. Some people loved the shuttle service. Others said it was kind of slow. Some people thought the rooms were comfortable and inviting. Others felt they were drab. Most guests reported polite staff, but there were also a few who felt the staff needed a wake-up call. The exercise room and pool were unanimously nice features however. All in all, if you find the price to be right, I would take a chance on this Houston airport hotel. Parking: Yes, there is parking. Well-lit parking lot. Buses and truck spots available. Pets: Yes, pets are allowed. $125 deposit per pet.